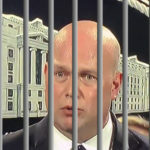 Earlier this afternoon, while Donald Trump’s illegitimate Acting Attorney General Matt Whitaker was still testifying publicly before the House Judiciary Committee, Palmer Report made the case that he’d just committed perjury, and he’d likely get rung up for it. Now a Democratic Congressman, who was in the room, is confirming that Whitaker did indeed commit perjury. Matt Whitaker was asked, directly and repeatedly, whether he’s discussed Special Counsel Robert Mueller’s investigation with Donald Trump. Whitaker tried every dimwitted trick in the book to avoid answering the question, before finally saying definitively that he has not discussed the investigation with Trump. Manu Raju of CNN ended up relaying a conversation on-air that he’d had with Democratic Congressman Steve Cohen, who sits on the House Judiciary Committee. According to Raju, Cohen said he believes Matt Whitaker was lying when he gave this answer. Cohen calls it like he sees it, but he’s smart enough not to make this kind of accusation unless there’s evidence to back it up. As Palmer Report explained earlier, it’s not just that one count of perjury that Matt Whitaker has to worry about. It’s that if he was willing to tell a lie like this just to escape the pressure of the moment, then he likely told several other similar lies today – and some of them will be far more easily provable than others. If Whitaker gets hit with perjury charges, he’ll have to cut a plea deal against Donald Trump.